His vessel wasn’t supposed to be at Great Harbor, Peter Island, BVI, taking on fuel, cargo and stores for the return trip to Southampton, UK. Ordinarily, the mail, passenger and general cargo vessel would have been at Charlotte Amalie, St. Thomas, US Virgin Islands, 20 miles away. In 1841, the Royal Mail Packet Steam Company established a coal refueling station there for its ships. From this point, passengers and cargo could transfer to smaller schooners with routes to other Caribbean islands, Central America and Cuba. 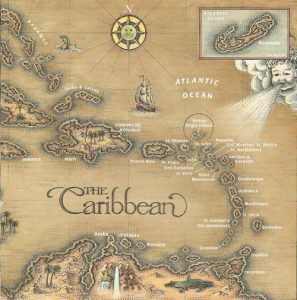 But with a scourge of yellow fever having swept through St. Thomas earlier, the company used Road Harbor, Tortola, and Great Harbor, Peter Island, to prepare for the trans-Atlantic voyage. The morning of October 29 was deceiving with clear skies and calm seas as dockers loaded the ship at Great Harbor. But the captain and all hands became wary when the barometer suddenly fell and skies darkened. As the wind increased, it appeared that a typical northerly tropical storm was brewing and everyone knew it was time to leave. But while weighing anchor in an attempt to sail to a safer locale, a shackle on the cable caught in the hawse pipe, snapped loose and dropped the 3,000 pound anchor and 300 feet of chain to the bottom of the harbor. Undeterred, the captain cut his losses and revved the engine to full speed steering seaward and by-passing the rocky channel. As he was rounding the tip of the island, almost in open waters, a violent wind sheer drove the ship on to Black Rock Point, Salt Island. With little warning, Wooley was washed overboard and crushed on the rocks as his vessel broke in two and disappeared in a flash. Survivors either swam to the island or clung to the masts and wreckage jutting out of the shallow water. Had it not been for the threat of yellow fever on St. Thomas, the Rhone would have avoided its fate and been in a much safer refuge. Designated as RMS Rhone National Park, the protected site has been called many things: “greatest experience in the BVI,” “a blue ribbon descent,” and “best wet T-shirt dive.” The latter refers to the 1977 Hollywood production of The Deep, starring Robert Shaw, Nick Nolte and Jacqueline Bisset. 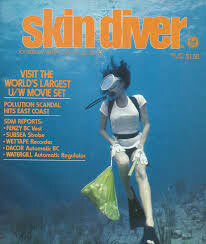 In one of the many open water dives, Bisset sports a revealing T-shirt that producer Peter Guber said, “It made me a rich man.” Skin Diver Magazine featured the attractive star in her memorable attire on one of its covers. 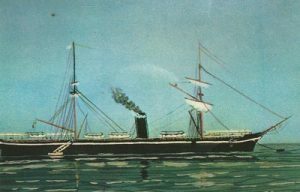 Although the film enhanced the popularity of the packet steamer, it needed no further hype after BVI diver George Marler wrote a book, The Royal Mail Steamer Rhone. Co-authored with wife, Luana, it takes readers on a guided tour in text and photos of the three sections of wreckage. 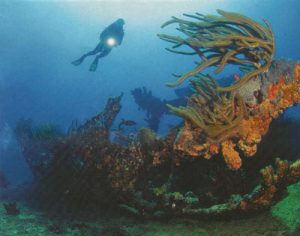 Billed by the BVI tourist board as “here for everyone,” the wreck does indeed cater to all divers including beginners, intermediate and experienced ones. Dives in crystal clear waters to 30, 50 and 80 feet provide colorful guideposts to the scattered remains of the once proud 310-foot iron-hull brig. Dropping down a rocky slope, the stern lists to its port side at 30 feet, its rudder jutting to within 15 feet of the surface. Squirrelfish, blennies and silversides school around the huge bronze prop which was powerful enough to drive the steamer at a top speed of 14 knots. The bow lies on its starboard side 80 feet deep with the foremast and crow’s nest nearby. A cannon partially protrudes from the coral, but as with all the remains, divers must look closely for it. One hundred and fifty years of growth has converted the wreck into a coral garden with brain and star formations as large as those on nearby Rhone reef. Sponges, anemones and nudibranchs flourish everywhere as if an artist had used a brush to splash on every vibrant hue in the spectrum. Wrasses, sergeant majors and queen angelfish create an endless feeding station out of growth on ribs that stick out of the superstructure. Blackbar soldierfish swarm over cup corals protruding from the wheel of an air vent. Grunts, groupers and a green moral eel take refuge in the shadows of the 500-hp engine. For snorkelers and scuba enthusiasts, the Rhone remains a source of endless beauty and world class diving. For those who went down with the ship, it sails on in the chronicles of infamy and the unfortunate stigma of being in the wrong place at the wrong time. What an interesting article all about the Rhone. I shall put this on my list of dives when I visit the Virgin Islands next summer. I will take my camera since it appears to have some beautiful backdrops. Yes. by all means take your camera. This is one of the best sites in the Caribbean for photos. The marine growth is beautiful and draws a variety of fish to it. Can you give me any hints or tips for photographing the Rhone? I’m excited about diving it and hope I can get some good photos. Thank you! The dive service probably will offer two dives. The first one is always the deepest. You can do that one, and on the way down check out what the wreckage looks like in the shallower waters. Then you’ll know what to return to on the second dive. Also, ask your divemaster for his/her opinion. Divemasters may have some favorites spots they will share with you. Happy and safe diving! I enjoyed the piece about the RMS Rhone. I have a question: Do you think the captain made a mistake by moving his vessel out of Peter Island Harbor to search for a safer place? It must have been a difficult decision. A good question! The sad part is that he almost made it around the point and out into the open sea. Not that he and his ship would have necessarily survived, but at least he would have had a shot at outlasting the hurricane. As it was, being blown up on the rocks ended eveything quickly…no chance to escape it. It was a sad end. Indeed, a magnificent wreck to dive on. We dived on her at noon, when we were virtually alone on the wreck , using the dinghy of our sailboat to get close. Truly breathtaking, but try to do your dive on calm, less crowdy, moments, you’ll have the wreck on your own and have the time to enjoy the passage under the hull and rudder fully! What a great experience. Thanks for sharing it. The passage under the hull and rudder was exciting. Thanks too for the tips on best time to dive it. Cheers, E.